Cheers to happy hour on Fredericksburg property. 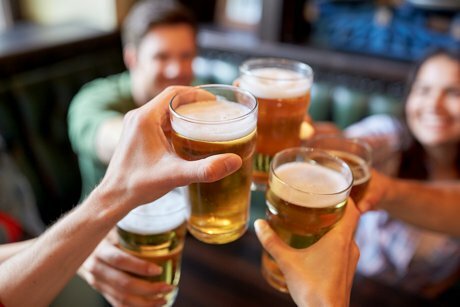 At Park Lane Tavern toasts ring out on a daily basis as friends celebrate the simplicity of a good day or the magnificence of fantastic news. Held Monday through Friday from 3 to 6 p.m. the timing is perfect for stopping in after work or to meet a friend for an afternoon date. Happy Hour specials include smaller portions of favorite items including Double Dip and Tavern Wings. After Happy Hour is over the deals keep coming with Weekly Happenings. Mondays mean half price fish and chips. It’s not thievery on Wednesdays during Steal The Glass. Really the friendly servers at Park Lane Tavern want you to keep the cup after indulging in featured beer. Live music rocks Thirsty Thursdays where pizzas are $6 throughout the day. More music fills the pub on Fridays for Martini Madness. From 11 a.m. to 3 p.m. Sunday Fundays bring the weekend to a close with an excellent Bloody Mary Bar. A favorite spot, this social hub is conveniently located at 1 Towne Center Blvd. Combining American fare with European tastes, an international flair adds to the flavor and to the ambiance. The menu is generous with something for everyone from Shepherd’s Pie to Jagerschnitzel. Appetites small and large are catered to with both a small plate and large plate section. Chef inspired entrees inspire mouths to water. Youngsters living in Fredericksburg are pleased with their very own choices. Selections on the Little Mates menu include Chicken and Chips, Pizza, and Salisbury Steak. Recognizing heartier appetites that don’t quite meet the adult menu standards, the Lads and Lasses category is just right for teens. More food than that on the little guys' later Banger and Mash and Cranberry Chicken Salad is just the right size. Don’t try to deny dessert. It’s simply too tempting. Berries and Custard, Cheesecake, and Irish Whisky Bread pudding tops off a filling meal perfectly.